Great news dance-lovers! 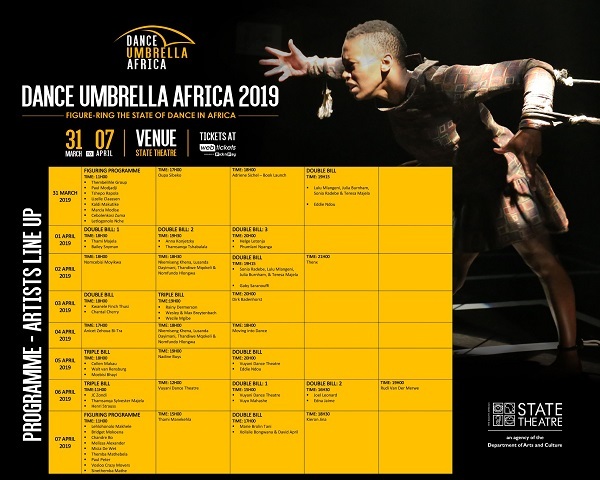 Dance Umbrella Africa will be launching this 31 March 2019, running for a full week of all things dance! Following the announcement at their 30th anniversary in 2018 that Dance Umbrella would be closing, the dance festival will now be hosted by the South African State Theatre in Pretoria under the new name of Dance Umbrella Africa. Under the Deputy Artistic Direction of award-winning dancer and choreographer Mamela Nyamza, this year’s programme will feature some of the best names in contemporary dance, including Julia Burnham, Sonia Radebe, Lulu Mlangeni, and collectives such as Vuyani Dance Theatre. There will also be talks and book launches. This year’s programme will take place from 31 March to 7 April at The SA State Theatre, and the full programme can be viewed below. Tickets are currently available via Webtickets.